The itinerary of 14 days helps you to visit almost highlights of Vietnam, Cambodia and Laos with Word Heritage Sites in Each country. In Vietnam, you have chance to discover 3 word heritages: from wonderful natural Halong bay to Hue ancient capital and Hoi An ancient town. In Cambodia, visit Angkor Complex – one of the largest religious monuments in the world. The tour will finish in Luang Prabang - an outstanding example of the fusion of traditional architecture and Lao urban structures. Upon arrival, tour guide and driver of S Vietnam Travel will welcome you. Tour briefing and transfer to your hotel. In the late afternoon, the guide will take you on a culinary adventure, sampling street food in the Old Quarter. It’s a great opportunity to try all those weird and wonderful foods you see but just aren’t sure what they are! Start your Hanoi Street “Eats Tour” at Bia Hoi corner to try the local brew, a draft beer that traces its roots to Eastern Europe. Enjoy breakfast at hotel then start a guided city tour of Hanoi. Having celebrated its 1000- year anniversary in 2010, the city has a rich and fascinating history. Your city tour will take you to the main attractions of Hanoi, including Ho Chi Minh complex (Ho Chi Minh’s mausoleum and stilt house); the Presidential Palace, the nearby One Pillar Pagoda, the Temple of Literature, West lake, Tran Quoc pagoda, Quan Thanh temple and of the city’s museum (History Museum or Ethnology Museum). Late afternoon, enjoy Water puppet show and cyclo visiting the Old Quarter of Hanoi. At around 7.30 am, your driver will pick you up for the journey to Halong Bay and arrive at around midday to board a traditional junk for an overnight cruise. Halong Bay is widely considered to be one of the natural wonders of the world. Thousands of towering pillars of sea and wind-carved limestone karst make the bay an unforgettable sight. After lunch, explore some of the huge limestone caves dotted around the bay and visit a floating fishing village. Then the captain will find a secluded spot where you can swim, soak up the sun on the top deck, or try your hand at kayaking. In the evening enjoy a seafood feast for dinner. Enjoy an early morning swim (during the summer), followed by breakfast as you cruise through more spectacular scenery. The cruise arrives at the harbor by noon. The driver will pick you up and then transfer directly to the airport for flight to Hue. Upon arrival in Hue, you will be transferred to your hotel. Check in and free time. Being the ancient capital, Hue is surrounded with ancient tombs of the past emperors, and with Orient style – those tombs almost located near the bank of Hue’s river – Perfume river. In the morning, take boat trip along the scenic Perfume River for sightseeing and next stop will be the famous Thien Mu pagoda and Ming Mang Emperor’s mausoleum. Afternoon, continue to visit the Citadel, containing the Imperial City, the Forbidden Purple City and the Emperor's private residence. The Imperial City, created in the 19th century and modeled on the Forbidden City in Beijing. You also visit the vibrant Dong Ba market. After breakfast, leave Hue for Hoi An, crossing Hai Van Pass where you will have magnificent view of the sea. Stop at Lang Co to have break. Visit the fascinating Marble Mountain en route to charming Hoi An. Check in hotel and free time. This morning, you will join in a cooking class at Red Bridge Cooking School. Visit Hoi An’s colourful market, and experience the amazing sights, sounds and aromas of this busy market. You will have the opportunity to interact with the local sellers and learn about all the ingredients to be used in the cooking lesson later. After that, board the Red Bridge boat for a leisurely cruise (25 minutes) along the Hoi An River to the Red Bridge Cooking School. On arrival, you explore the cooking school’s herb and vegetable garden, before learning about some of Hoi An’s and Vietnam’s well-known dishes. The cooking lesson runs for about 2 hours – each dish is first demonstrated by the Red Bridge chef’s, before you prepare the same dish youself. Included in the class is a brief introduction to Vietnamese food carving (plate decoration). After the lesson, you can enjoy what you have cooked. In the afternoon, enjoy a walking tour of the ancient town, including the 200 year-old Tan Ky house, Phuc Kien Pagoda, the Assembly Hall, the former merchants’ houses, the 400 year-old Japanese Covered Bridge. Free time for shopping and tailor made suits. You have free time in the morning in Hoi An. After check out hotel, you will be transferred to the airport for the late flight to Siem Reap. Upon arrival in Siem Reap, pick up and transfer to your hotel. Check in and free time. This morning you visit the smallest, but magnificent, Banteay Srei built in the 10th Century and dedicated to Shiva. The temple was the birthplace of Khmer classical style architecture and the bas-relief work is the best example of Khmer classical art remaining. The pink sandstone structure bears a series of striking and beautiful sculptures, lintels, pediments and friezes. Khmers say the temple must have been carved by women for the details are too fine for the hands of a man. Continue the trip with a visit to the Banteay Samre Temple adorned with impressive reliefs depicting scenes of Vishnu as well as Krishna legends. In ther afternoon, you have chance to visit the ancient Khmer civilization site of Hariharalaya which flourished in the late 9th and early 10th centuries. These are the earliest temples in the Angkor area and are referred to the Rolous group (Lo Lei, Preah Koh, and Bakhong Temples). On the way back to Siem Reap, you will visit Kompong Phluk – a floating village on Tonle Sap lake, the “Great lake” of Cambodia. With traditional wooden boat, you pass by floating villages with friendly children in small boats and fishermen at work. The village moves with the water level and during wet season houses are anchored around an island pagoda. You have free time in Siem Reap today. After check out hotel, you will be transferred to the airport for the flight to Luang Prabang. Upon arrival in Luang Prabang, pick up and transfer to your hotel. Check in and free time. This morning, you will visit the impressive stupa of WatVisoun, the shrine of WatAham. You continue to explore LuangPrabang with the temple of WatXieng Thong, a magnificent piece of architecture, which nestles at the meeting of the Mekong and the Nam Khan River. The temple structures are decorated in various ways with gilded stuccoes as well as doorways and the main sim has a marvelous 'tree life' mosaic pattern on an outer wall. In the afternoon, board a cruise upstream on the Mekong river, which also gives us a beautiful view of the tranquil countryside as well as an interesting visit to the mysterious of Pak Ou Caves. It is famous for thousands of gold lacquered Buddha statues of various shapes and sizes. Along the way, you stop at the village of Ban Xanghai, where they make the distillation of local rice wine. It used to be more famous for the big jars it is stored in, which they've been making there for over 2000 years. On the way back, you have chance to enjoy sunset on Nam Khan river. An optional early start gives you the fantastic opportunity to participate in the daily morning rituals of saffron-clad monks collecting offerings of Alms (ubiquitous sticky rice) from the faithful residents. This tradition is very unique in Laos, being the only Buddhist nation still preserving the procession. You will visit the morning Phosi Market where you will see such diverse offerings as dried buffalo skin, local tea and saltpeter among the chickens, vegetables and hill-tribe weavings. Today set off your exploration with a visit to the Royal Palace also known as the National Museum to learn more about the long-lasting history and culture of the region. You also visit Wat Mai, a beautiful temple located nearby Royal Palace and built in the 18th century. It is the largest and most richly decorated of the temples in Luang Prabang. Afterwards, you head to Kuang Sy Falls a stunning turquoise waterfall. On the way, you will pass through rice fields and beautiful small villages dotted along country road. Make a stop at some of the villages. Take a fresh swim to refresh yourself in many basins. The balance of day is free at leisure. After check out hotel, the driver will pick you up and then transfer to the airport for your departure flight. End of the trip. Thank you for using our service. 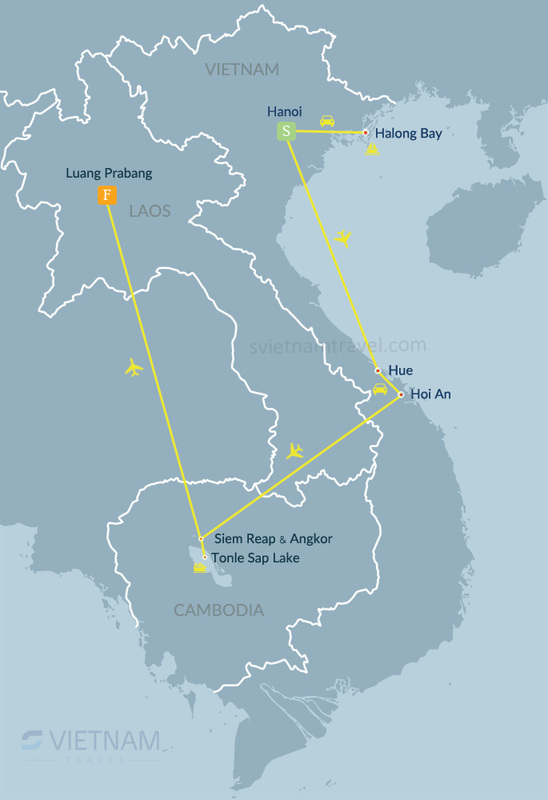 Flight tickets Hanoi - Hue, Danang - Siem Reap, Siem Reap - Luang Prabang.